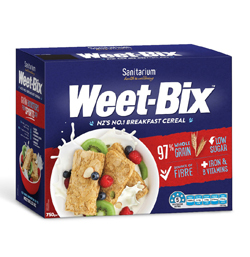 Weet-Bix contains 97% wholegrain which provides you with energy throughout the day. It is a healthy breakfast being naturally high in fibres, contains 7 essential vitamins and minerals and has a low fat and sugar content. It’s a tasty and healthy way to start your day. Been here so long I have become to Weetabix which while I like them they aren't a a patch on good old Weet Bix. Weet Bix have that malty flavour that just makes you think of home. My cousins when we were kids used to grab a couple of weet bix and put butter and jam on them and eat them as a snack. Absolutely Delicious, The Best There Is! This has to be the best type of Weet-bix that exists in the world! Much better than the Weetabix on sale here in the UK. Have already ordered some more and have thought about ordering even more! Highly Recommended :). Weet bix is the best ! Best weet bix money can buy, better than the English weetabix since is was invented down under it has to be good !